When you notice that your home isn’t heating itself properly in the winter, you most likely look to the furnace to see what’s going on. While this is usually the first instinct, it’s not always the cause of the problem. Sometimes, a faulty thermostat is the real problem. If your thermostat is not communicating property with your furnace unit, you are bound to have problems. The heat may not kick in when it’s supposed to — or it may kick in too high, overheating your home. When it’s time to change out your old thermostat, follow these DIY steps to help you through the process. Step 1: Turn off the power to your HVAC unit. You can turn off the unit by shutting off the proper breakers on your home’s electrical panel. 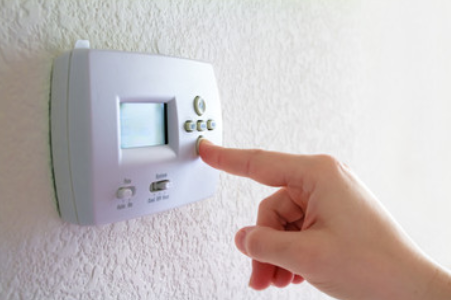 Test out the thermostat to make sure it is completely off before you start going to work. Step 2: Remove the old thermostat cover and disconnect the wires. You will likely need a small screw driver to disconnect the wires (this will depend on the model). Step 3: Remove the old mount piece. This is just the piece that holds the main thermostat onto the wall. Step 4: Install the new mount and connect the wires. You should be able to follow the instructions on the mount which will tell you which colors go where. Step 5: Install the thermostat onto the mount. This should snap in fairly easily by lining it up properly. Step 6: Return power to the HVAC unit and test out the thermostat by turning on the AC and heat to ensure that it works properly in both settings. Step 7: Refer to the owner’s manual to ensure that you have the correct settings in place. For some of the more complicated smart thermostats — like the nest — we recommend using a trained HVAC professional or electrician for installation.